Comments - Striking view of Minakami at twilight, the sky filled with yellow light as the sun begins to set. Bare trees are sharply silhouetted in black and deep red brown against the soft plum colored tones of the village and mountains in evening shadows. A warm glow come from the lighted windows of the town, and golden sunlight plays on the rippling surface of the river. 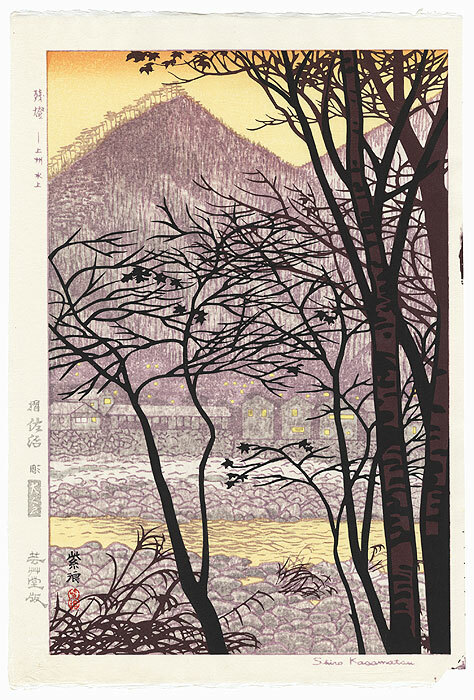 A terrific shin-hanga design with an effective use of a limited color palette. The first time we've offered this Shiro subject.